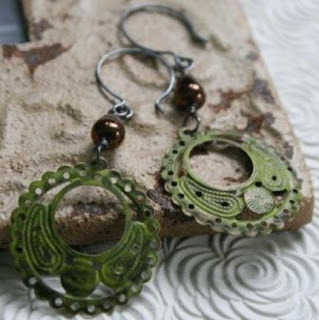 We are ecstatic to have Linda of Luluz join us again as a vendor at The Fall Funky Junk Sisters Show. She always seems to find the most original things. We fell in love with her style the first time we saw her at The Farm Chicks Show in Spokane. 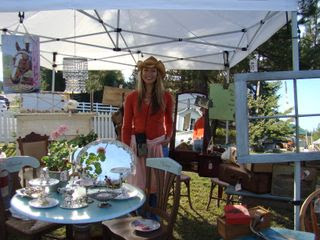 She is always on the HUNT for JUNK and we are anxiously awaiting the arrival of her van at our show! Linda also has a space at the Tacoma Antique Center in Fife, WA. Be one of the first to shop her booth, Friday night, October 23rd 6-9 pm. It is just around the corner! Can you say gourmet? 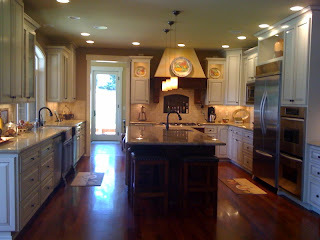 Creamy colored cabinets with a warm glaze are enhanced by the island and the sink cabinet in dark wood. 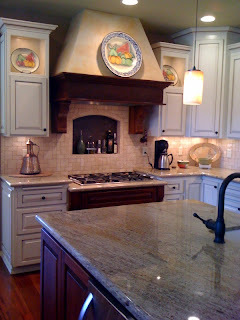 Slab granite and earth tone tiles add to the updated Tuscan feel. Throw in this farm sink and you have perfection. 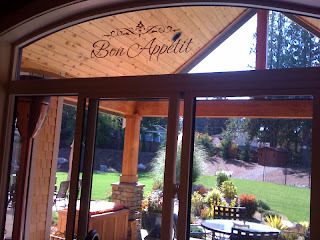 Above the sink is this lovely curved window that Cindy embellished with vinyl lettering. 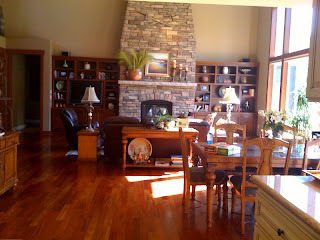 This is the view into the large but cozy great room. Cindy is creative too! 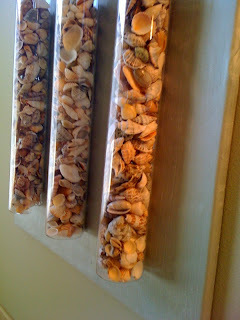 Just look at what she made to hang above the soaking tub in the master suite. She was inspired by a photo she saw in a catalog. Now that is our kinda girl! Before you know it you too will be celebrating your 27th wedding anniversary! Sept 25, 1982. Wow seems like yesterday. Dixie and I both love vintage cards and try to pick them up whenever we come across them. 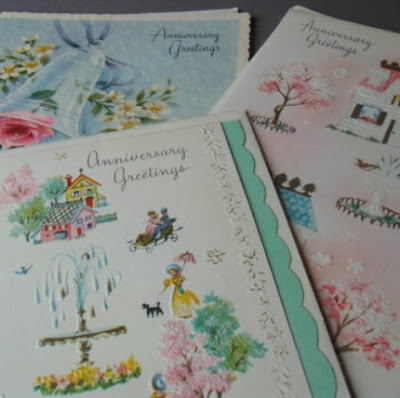 These anniversary cards are no exception, they are so sweet. They remind you of simpler times, don't they? The gals at Today's Country Store in Sumner, Washington always have plenty of vintage stationery available. 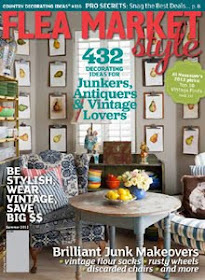 Once again Kris and Amy will be vendors at our Fall Funky Junk Sisters Show. They have been saving up their very best junk just for our show & we can't wait to see it! P.S. Honey I love you, here's to 27 more years! Funky Junk Sisters Exclusive Girls Night Out Event-Shop Early for a Cure! Don't miss out on this event! Buy your tickets today, right here on our blog. A couple of days ago I visited the Breast Cancer Resource Center in Tacoma. What a wonderful facility filled with caring people. The Breast Cancer Resource Center is here to support and enhance the quality of life for people meeting the challenges of breast cancer and increase the awareness and knowledge of breast cancer and breast health. 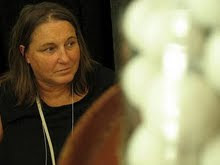 Founded in 1998 by local breast cancer survivors and health care professionals, the Breast Cancer Resource Center's programs and staff seek to address the holistic needs of people affected by or who are at-risk for breast cancer. BCRC's services are delivered in a warm, caring and supportive environment at absolutely no cost to clients. The Funky Junk Sisters are proud to donate to this wonderful organization. Get involved and shop our Fall Funky Sisters Show early! Buy your tickets today! As the air becomes crisp and summer fun gives way to indoor activities, it’s time to make your home look as warm and inviting as possible. Want the look below? Dark wood tables look beautiful, but if you don't have the right shade of wood or don't have a wood table at all, use a colorful/patterned tablecloth to create an autumn setting. 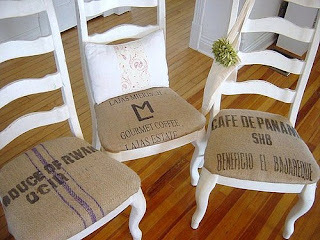 Warm colored cushions or slip-covers can be used to enhance the look of your chairs. 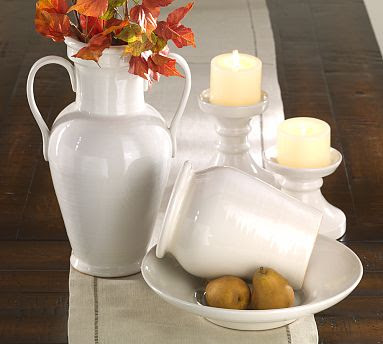 Simple white pottery stands out to contrast against all of the colors to create visual interest. 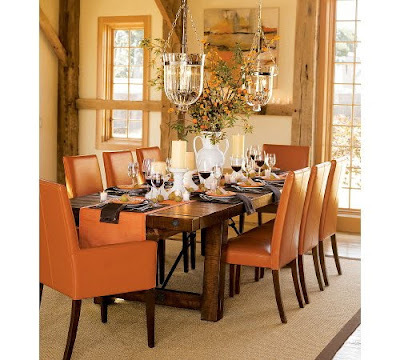 Hanging candlelit pendants are shown in this space, but glass/crystal hurricanes can be set on the table to achieve the same look. Never invest in a wild colored upholstered piece. 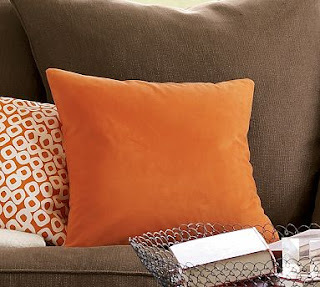 Use pillows or slip covers to accent the furnishings, and change them to reflect the seasons. 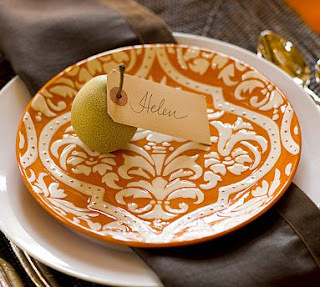 Orange is such a wonderful fall color, adding it into your fall china collection is a great way to bring in a touch of fun color. 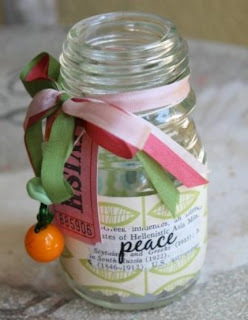 Use real fruits like pears and apples of all shades as hangers for your guest's place cards. White or cream colored pottery can be used for almost any season, and are good to have in your general collection of accessories. 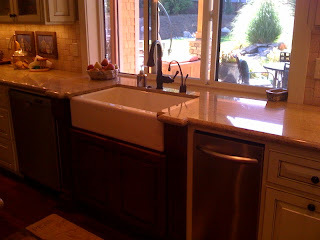 Check out this glass tile application..... it seems very similar to the fun funky mood rings we wore as kids. Very cool, so cool that you might want to have a party in your shower to show it off! 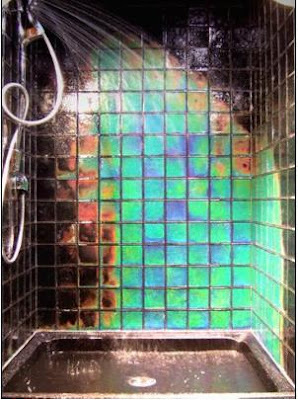 The Moving Color glass tile is designed to dynamically change its color as the heat exposure changes. It uses special dye to achieve the color changing effect. 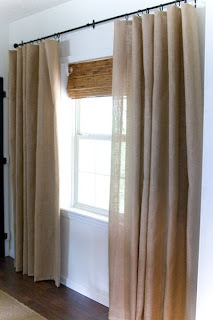 The heat can come from warm water or radiant heat source. The Moving Color tiles can be used with any kind of water application and require common tile tools to install. 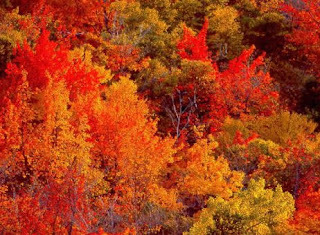 When temperature is applied, color will move from black or other standard colors through the color spectrum, and then reverse to the original upon cooling. The uses of these glass tiles are limited only by your imagination. See the Moving color showcase ... The price is around $180 for 1 sq. ft of 4 x 4 Glass Tile. 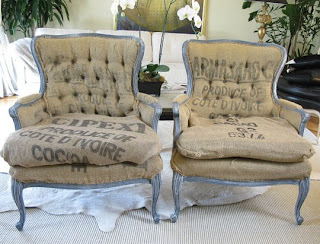 We are in love with the rustic texture of burlap, especially when it is paired with a more sophisticated fabric. 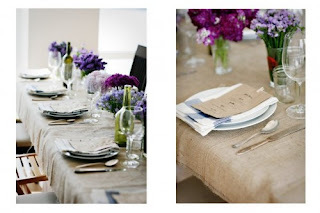 This table setting below is so elegant, yet it is set with burlap. Brown paper bags were used as menus. Brilliant! 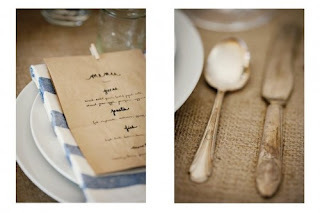 Simple blue and white cotten dish towels are used for napkins and mason jars for drinking glasses. Tarnished silver adds to the charm. This is a great idea for outdoors. This picture is calling our name....we feel a project coming on! 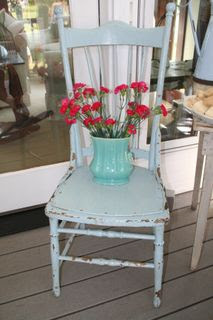 Another idea for chairs, what a great way to add some french fancy to your dining room! 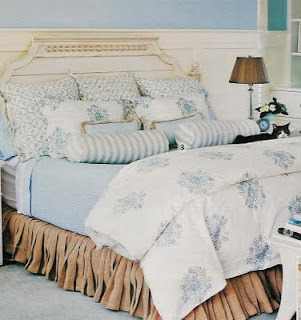 Just a touch of whimsy to a soft delicate room....absolutely scrumptious! Ya'll are gonna love these gals! 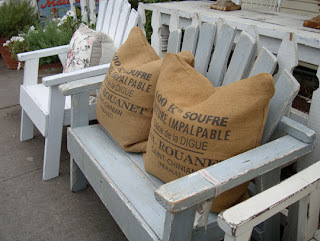 We have a new vendors joining us for our Fall Funky Junk Sisters Show, Billie of Favorite Finds and Pat of Outback Antiques. 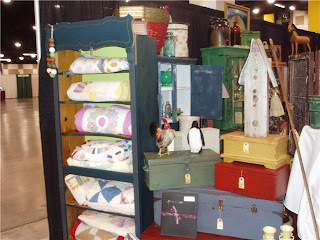 Here are some pictures of their booth at the Puyallup Home & Antiques Show this past winter. 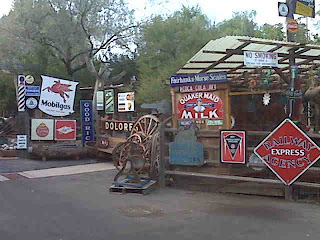 Don't you just wonder what stories these vintage items could tell? Part of the intrigue of antiques is the wonder about their past. Sometimes if we are lucky enough we learn about it, other times you have to leave it up to your imagination. The thought of a simpler time is so comforting. Don't cha think? The lovely Tippy Stockton will be joining us again as a vendor for our Fall Funky Junk Sisters Antique Show and Flea Market. Here are a few pictures of her cool funky things. And her jewelry is to die for! She is helping us out again, this time with our Pink Project! 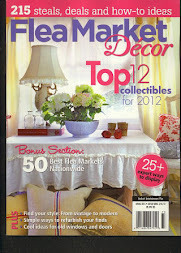 Our very creative friend and fabulous designer, Debi Ward Kennedy is helping us out once again! Not only will she be a vendor at our Fall Funky Junk Sisters Show but we asked her to design our Super Fabulous Pink Christmas Tree. We call it our Pink Project, it is the Pink Tree that we will raffle off at our special fundraiser event to help Save The Ta Tas on October 23, 2009. 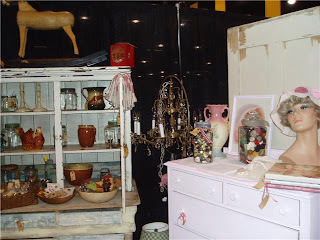 This event will raise money for Breast Cancer Research and it will get you in early (seriously before anyone else) to shop & party at the Fall Funky Junk Sisters Antique Show. 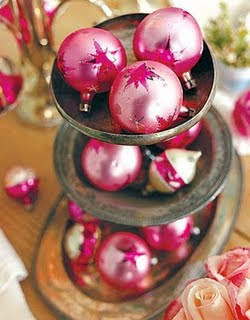 Each of our vendors is taking special care to design and donate a one of a kind pink ornament for our Pink Tree. You can be the lucky winner by attending our event! All you have to do is purchase your admission ticket here on our blog (click on the buy now button). Your ticket will give you entrance to our exclusive fundraiser party and it will get you special discounts with participating vendors, PLUS you will receive a raffle ticket for our Pink Christmas Tree! Wait a minute that's not all, there will be door prizes, music, food and sparkling beverages too! In addition, we are working on a special gift for you from us, just for attending. So make those plans to shop for a good cause on Friday evening October 23. We look forward to visiting with all of you. I just knew this was going to happen. I mention the H word and suddenly I have a Christmas project! This one's worth thinking about as I sit on the beach in the sun, however... it's for a very special event in October, for some very special gals. 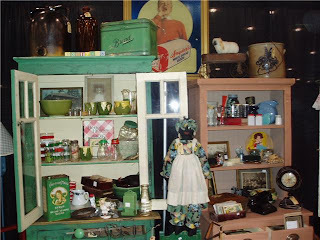 Check out the Funky Junk Sisters web site and the info on their Fall Antique & Flea Market Show. They've asked me to decorate an all pink Christmas tree for the 'Save The TaTas' special event on Friday, October 23 to benefit breast cancer research. I am most happy to support both this worthy cause and this show. Ideas for this tree are already swirling like cotton candy in my head! 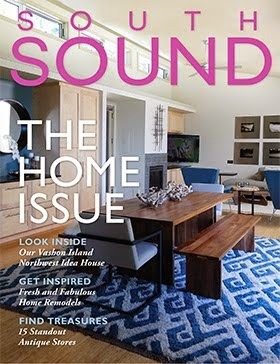 I'm also going to be a vendor at this show with our Retreat Collection furnishings & home decor accessories, and will have to create some very special pink items to contribute to the festivities. I'm thinking that a pink addition to my famous 'Junk Queen Crown' line is in order.... sans ta ta's, of course! We can't wait to see what she comes up with. It will be a wonderful surprise. 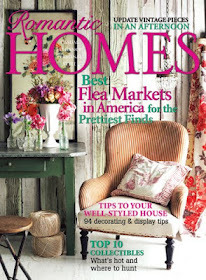 Photo Credit: Country Living Magazine online, via google image search. 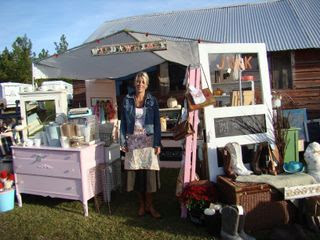 Dixie and Funky Junk Sister #4 will be in Rathdrum, Idaho today to visit a very fun show at The Vintage Barn. Here are some pics from some of their previous shows.... Doesn't it look like so much fun? I'm a little jealous that I won't be there, but I am in Oklahoma getting ready to tailgate and watch a football game. Some things are even more important than fun junk! Like a son playing in one of the biggest games of his life....I wouldn't miss that for anything in the whole wide world. Watch for pictures next week from the Vintage Barn Show, and if your in Rathdrum Idaho today, stop by and say hello to Dixie! 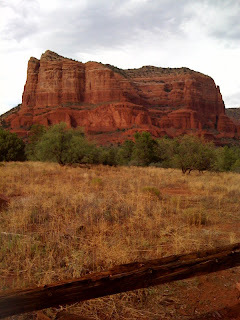 Phoenix was a little hot for us so we decided to drive to Sedona where it was a bit cooler. What a gorgeous place. 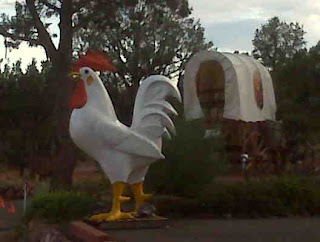 We absolutely loved it and knew we made a great choice for a drive when all of a sudden we saw this, larger than life.... 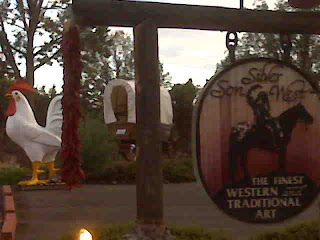 This place was full of fun finds, Silver Son West. 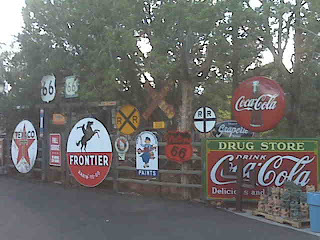 In Sedona a town full of lovely tourists galleries, this shop full of western art stuck out like a sore thumb! Just our style! These signs greet you as you walk in. WE told you it was FULL of interesting things. 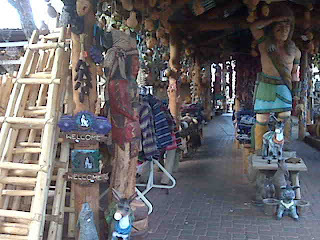 Can you see the tall wooden Indian welcoming us in? 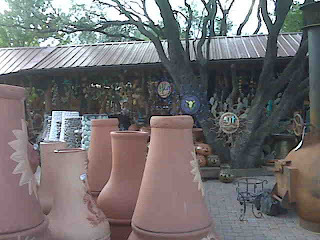 Want a chiminea? Plenty of choices here! 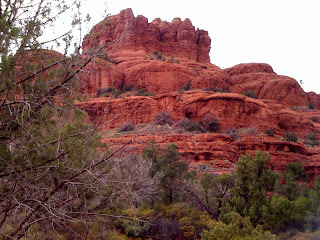 Here are a few pictures of the scenery from our hike. 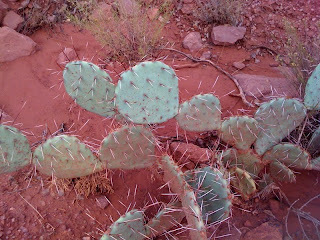 The contrast of the red rock and the greenery was spectacular. 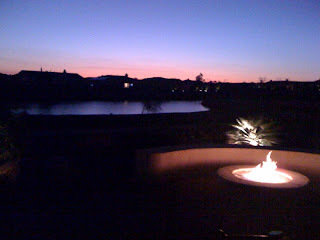 We are in Arizona enjoying the sunshine and the sunsets. We are having a fabulous time and just had to show you this beautiful sunset. We are staying a in beautiful home on a golf course (courtesy of brother and sister in law), just outside our window is a pond and the 12th hole. A few minutes ago we saw three coyotes stroll by, seriously strolling. They weren't terribly afraid of us at all! 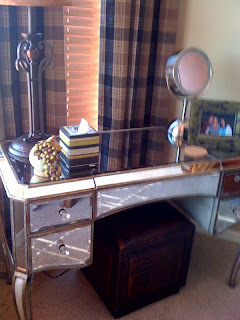 The vanity below is one of our favorites pieces in the house, it is a mirrored vanity. Here is a close up of the drawers. So glamorous! 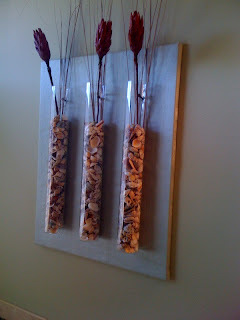 Shot this picture in a restaurant in Scottsdale called The Roaring Fork (trendy, good food and a great happy hour!). 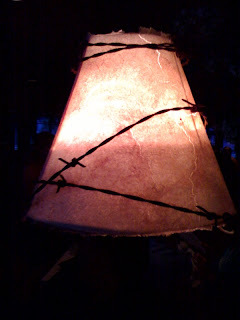 Who knew barbed wire could look so good. We will continue to blog from the road, so keep checking back. Enjoy your holiday weekend!